Density-functional theory is used to investigate sulfur dioxide physisorption inside and outside of single-wall carbon nanotube of (5,0) and (5,5). This study is conducted at B3LYP/6-31G* level of theory. Sulfur dioxide molecule is studied with axis oriented parallel or perpendicular to the nanotube wall. Both internal and external adsorption on nanotubes is increased with the angle of interaction being at maximum of 90° to the tube axis. The harmonic frequencies are computed from analytical derivatives for all species in order to define the minimum energy structures. The lowest value of HOMO and LUMO energies is obtained in the process of the adsorption on the external wall of (5,5) nanotube. The dipole moment of the SWCNTs-SO2 system is highly increased and it is more than SWCNTs- H2S and SWCNTs- CO2. The lowest ΔGtot for SO2 on the outside wall of (5,0) is obtained while this quantity is positive and not a favorable adsorption process for H2S on the nanotubes. The NBO analysis showed the change in the electronic structure of nanotubes could be suitable for fabricating sensors. N.D Nevers, Air Pollution Control Engineering, McGraw-Hill, 2000. S.R. Bagheri, E. Jamshidi, A. Najafabadi, Chem. Eng. Technol. 30 (2007) 250. L. Curtis, W. Rea, P. Smith-Willis, E. Fenyves, Y. Pan, Environ. Int. 32 (2006) 815. H.S. Peavy, D.R. Rowe, G. Tchobanoglous, Environmental Engineering, McGraw-Hill, 1985. E.T. Thostenson, W.Z. Li, D.Z. Wang, Z.F. Ren, T.W. Chou, J. Appl. Phys. 91 (2002) 6034. J. Suhr, N. Koratkar, P. Keblinski, P. Ajayan, Nat. Mater. 4 (2005) 134. F.H. Gojny, M.H.G. Wichmann, U. Köpke, B. Fiedler, K. Schulte, Compos. Sci. Technol. 64 (2004) 2363. J. Che, T. Cagin, W.A. Goddard, Nanotechnology 11 (2000) 65. H. Huang, C.H. Liu, Y. Wu, S. Fan, Adv. Mater. 17 (2005) 1652. M.J. Biercuk, M.C. Llaguno, M. Radosavljevic, J.K. Hyun, A.T. Johnson, Appl. Phys. Lett. 80 (2002) 2767. E.T. Thostenson, C. Li, T.W. Chou, Compos. Sci. Technol. 65 (2005) 491. P.G. Collins, K. Bradley, M. Ishigami, A. Zettl, Science 287 (2000) 1801. P. Giannozzi, R. Car, G. Scoles, J. Chem. Phys. 118 (2003) 1003. S.A. Babanejad, F. Ashrafi, A. Ghasemi, Arch. Appl. Sci. Res. 2 (2010) 438. A.A. Rafati, S.M. Hashemianzadeh, Z. Bolboli Nojini, J. Phys. Chem. C. 112 (2008) 3597. M. Cinke, J. Li, Jr. C.W. Bauschlicher, A. Ricca, M. Meyyappan, Chem. Phys. Lett. 376 (2003) 761. X. Lu, C. Sun, F. Li, H.M. Cheng, Chem. Phys. Lett. 454 (2008) 305. J.F. Espinal, A. Montoya, F. Mondragon, T.N. Truong, J. Phys. Chem. B. 108 (2004) 1003. D. Henwoo, J.D. Carey, Phys. Rev. B 75 (2007) 245413. K. Azizi, S.M. 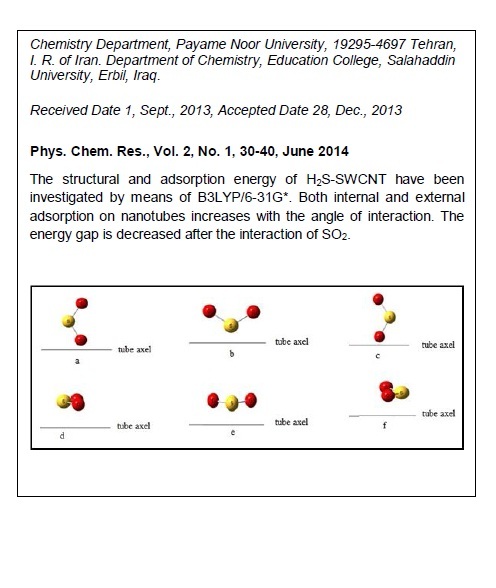 Hashemianzadeh, S. Bahramifar, Current Applied Physics, 11 (2011) 776. Yu, SeGi; Whikun Yi, "Single-Walled Carbon Nanotubes as a Chemical Sensor for SO2 Detection, Nanotechnology, IEEE Transactions on, 6 (2007) 545. A.C. Lua, T. Yang, Chem. Eng. J. 155 (2009) 175. X. Zhou, W.Q. Tian, X.L. Wang, Sensor. Actuat. BChem. 151 (2010) 56. F. Yau, D.L. Duong, S.C. Lim, S.B. Yang, H.R. Hwang, W.J. Yu, I.H. Lee, F. Günes, Y.H. Lee, J. Matt. Chem. 21 (2011) 4502. J. Zhao, A. Buldum, J. Han, J.P. Lu, Nanotechnology 13 (2002) 195. M. Oftadeh, B. Gholamalian, M. Hamadanian, J. Nanostruct. 1 (2012) 213. M. Oftadeh, M. Gholamian, H.H. Abdallah, Int. Nano Lett. 3 (2013) 7. V. Barone, B. Mennucci, G.A. Petersson, H. Nakatsuji, M. Caricato, X. Li, H.P. Hratchian, A.F. Izmaylov, J. Bloino, G. Zheng, J.L. Sonnenberg, M. Hada, M. Ehara, K. Toyota, R. Fukuda, J. Hasegawa, M. Ishida, T. Nakajima, Y. Honda, O. Kitao, H. Nakai, T. Vreven, J.A. Montgomery, Jr., J.E. Peralta, F. Ogliaro, M. Bearpark, J.J. Heyd, E. Brothers, K.N. Kudin, V.N. 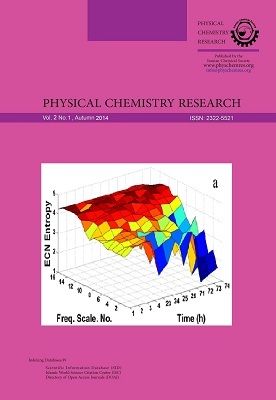 Staroverov, R. Kobayashi, J. Normand, K. Raghavachari, A. Rendell, J.C. Burant, S.S. Iyengar, J. Tomasi, M. Cossi, N. Rega, J.M. Millam, M. Klene, J.E. Knox, J.B. Cross, V. Bakken, C. Adamo, J. Jaramillo, R. Gomperts, R.E. Stratmann, O. Yazyev, A.J. Austin, R. Cammi, C. Pomelli, J.W. Ochterski, R.L. Martin, K. Morokuma, V.G. Zakrzewski, G.A. Voth, P. Salvador, J.J. Dannenberg, S. Dapprich, A.D. Daniels, Ö. Farkas, J.B. Foresman, J.V. Ortiz, J. Cioslowski, D.J. Fox, Gaussian, Inc., Wallingford CT, 2009. G. Lendvay, I. Mayer, Chem. Phys. Lett. 297 (1998) 365. A.E. Reed, L.A. Curtiss, F. Weinhold, Chem. Rev. 88 (1988) 899.